Surf Air’s Jim Sullivan provided this map of a new approach route (green line) the airline can take to the San Carlos Airport from near Moffett Field when conditions allow a visual flight rules (VFR) approach. The route that would continue to be used when visibility is bad is the straight line in orange and the shaded area is currently used by Surf Air pilots in VFR conditions. 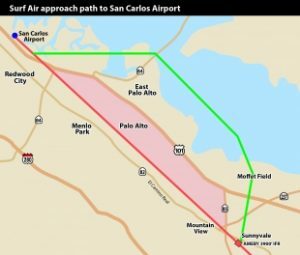 On Tuesday, April 26, Jim Sullivan, Surf Air’s senior vice president of operations, showed the San Mateo County Board of Supervisors a map with a route that would take Surf Air planes from Moffett Field over the Bay, past the Dumbarton Bridge and then back to the San Carlos Airport over a cement plant. Mr. Sullivan’s presentation was part of an undate for the supervisors from the county’s public works director, Jim Porter, on what the county is calling the “San Carlos Airport Aircraft Disturbance Study.” The supervisors approved the study in March. Mr. Sullivan said the airline has been working with the Federal Aviation Administration’s Northern California air traffic control branch, known as Norcal TRACON. They are trying to find a way to move the commuter airline’s planes away from the neighborhoods where residents say the noise has been making their lives miserable. “I really do believe this is the meaningful relief that we’ve all been looking for,” Mr. Sullivan said on Tuesday, before catching a Surf Air plane from the San Carlos Airport back to work at Surf Air’s Santa Monica headquarters. He said he personally piloted the Bay approach last week and believes it will work. He plans to have Surf Air’s “check pilots,” the pilots who train other pilots, fly the approach 25 times, starting immediately, when they fly into San Carlos. “By having multiple pilots look at it multiple times” any problems can be found and the route modified, he said. Surf Air will then train all its pilots to use the approach, and Norcal TRACON will inform the control towers in all the local airports, including San Jose, Moffett Field, Palo Alto, San Francisco and San Carlos, about the new approach, Mr. Sullivan said. The route won’t provide complete relief to those who live under the current flight path because, Mr. Sullivan said, it can only be used under Visual Flight Rules (VFR) conditions. That means that if pilots can’t see the airport from the point at which they start the approach, which is near Sunnyvale, the current GPS approach will continue to be used, he said. Rainy or foggy days can limit that visibility. Mr. Porter told the supervisors that the county has hired three consultants: an aviation consultant, an aviation noise consultant and a polling firm. “We’re looking at policies and procedures,” he said, including surveying what other general aviation airports do. “We’re also potentially looking at landing fees,” he said, including software to help with that process. He said the county is also examining incentives for those who follow the airport’s voluntary noise abatement rules. “We are working diligently to make that schedule,” Mr. Porter said. Atherton City Council member Mike Lempres asked the county to get residents more involved in the process. Other speakers said that since Surf Air is working to solve the problem on its own, the county should halt the study. “We ask that you postpone further action or expenditure” until the planned changes are put in place, said Carol Ford of the airport’s pilots’ association. “This isn’t to punish the pilots or the people at the airport,” she said. Supervisor Dave Pine agreed. “It’s important we keep this study going,” he said. He, too, emphasized that the study is not aimed at the majority of the airport’s users. “The impetus of this has been commercial aircraft, primarily Surf Air,” he said. 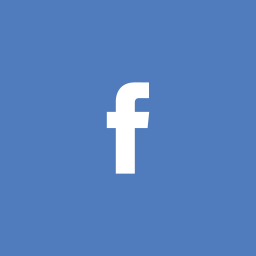 After the meeting Mr. Lempres praised the county and others who have become involved in working to resolve noise issues, especially congressional representatives Anna Eshoo and Jackie Speier. “Airplanes louder than 757s, 777s and 787s should never have been allowed to be as low as a thousand feet over our homes and schools,” he said. “We are excited that the group has finally come together and rolled up their sleeves and said how do we fix this,” he said.